We invite you to Cairns’ ONLY SCREENING of ‘Black Hole’ – a documentary telling the story of the struggle against Whitehaven Coal’s Maules Creek mine in the Leard State Forest in NSW. Told in a collective narrative of ﬁrst person accounts with characters that thread throughout the ﬁlm (including CAFNEC’s own Marine Response Team member Elise Chatterton! ), ‘Black Hole’ is gaining rave reviews. TICKETS: Please book tickets now to ensure this event goes ahead. The film is hosted by CAFNEC’s own Elise Chatterton, who was part of the Leard Blockade. After the film there will be a short Q&A with Elise and the opportunity to discuss how you can get involved in the campaign to keep coal in the ground, all around Australia. The stage has been set for one of the most intriguing David and Goliath battles in this nation’s history. 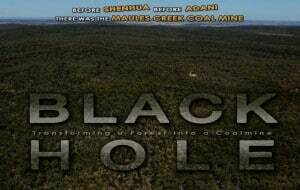 ‘Black Hole’ is the story of one of the most controversial coal mining projects in Australia. This story is happening now. Filmed in real time and in the moment, this film is capturing the events as they unfold with the excitement of the unknown. Black Hole explores the fight to stop the clearing of the Leard State Forest, transforming it into an open cut coal mine. Black Hole is a feature documentary that aims to tell the Maules Creek story through the voices of the many diverse and colourful characters including the Local Farmers, Indigenous Elders, Scientists, Community Supporters, Mining company personal, Police and Politicians. The community concerns range from the destruction of sacred Indigenous burial sites, the clear felling of one of the last intact areas of White Box Forests, including the native flora and fauna, water table contamination, water acquisition rights, coal dust pollution and cost of living just to name a few. Please book tickets now to ensure this event goes ahead. This is the only time this film will be screened in Cairns and we need to sell enough tickets in advance. Please spread the word!